We are currently moving thru a powerful window of completion spanning our annual Galactic Core, Sun & Earth alignment (12/17-19) and the solstice (12/21), which then culminates during the highly feminine Cancer full moon window (12/22) → bringing us right to Christmas day (12/25). As we close this (11/2) year in mastery of (divine) union we also open to complete rewrites of reality, becoming the sacred house of spirit to dwell within…to Create from. According to my Sources, this potent period is leading us to the even more potent universal 12/3 year (2019), heralding the last in an intense series of diamond light body activations. These final downloads for 2018 are providing those prepared with the codes needed to move into the central, or physical ascension experience which will be the main focus/theme for next year. 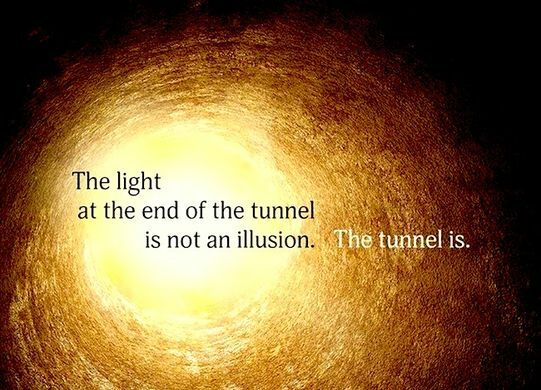 This month is like walking thru a long dark tunnel to arrive there…it can be deceptive to an untrained mind, but because we can see the new light just up ahead, it propels us forward knowing that we are merely steps away from the illumination of what awaits. This is no doubt a very special sacred season that may ask a lot from us, but all in preparation for a major acceleration in our evolution. This entry was posted in Uncategorized and tagged diamond bosy light activations, highly feminine Cancer Full Moon, Lauren C. Gorgo, love, mere steps away from illumination, powerful window of completion, very special sacred season. Bookmark the permalink. I absolutely love and adore the quote in the picture! I do feel some major growth opportunities are around the corner, for those who want to walk towards them!